moment by moment — with ourselves and in relationships with others. It is a practice of compassionately embracing all of life. living in the fullness and flow of life as a daily spiritual practice, what I call Living Compassion. This book, created over years of sharing and teaching workshops, individual sessions, and retreats, leads the reader into unsuspected depths. It is a guide for exploring dimensions of wholeness and healing; an invitation to approach our experience in a radically different way. We enter into our difficult experiences to reveal the fullness and beauty in all experience. Click here to more of the introduction to Robert's book of reflections. 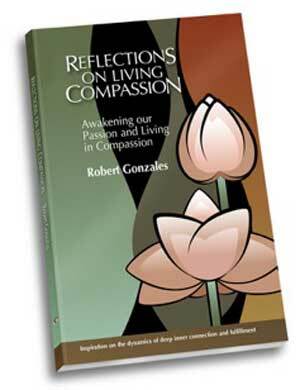 Reflections on Living Compassion may be ordered here for $10.00 plus shipping. For shipping within the United States the charge is $4.50 and outside the US it's $14.50 USD. (If ordering more than 3 copies, note that additional shipping charges will apply.) Please click the links below to order. You may also get a ePub, Kindle or PDF version of the book for $7.99 using the links at the bottom to pay. Buy the book formatted for various ePub, Kindle, etc. formats. Access a PDF file of the book: After paying, click "Return to the Center for Living Compassion" link to access the book. Price for this PDF edition is $7.99.